Onofre switched from the Democratic Party to the Republican Party when she ran for the Santa Ana City Council in 2012. She has since moved to Irvine and now appears to be returning to her roots. This is a stunning development in that Onofre had been accepted into the OC GOP and was even working for a time for State Senator Bob Huff, who leads the GOP in the State Senate. Onofre told me today that Huff apparently led an effort by his party’s Senate delegation to vote against driver’s licenses for undocumented immigrants. That apparently turned her off and she left his employ and has now left the Republican Party. Onofre is a businesswoman and I believe her when she says she is a conservative. But she is hardly the first Latina to leave the GOP. I left the party a few years ago, for similar reasons. I tried the Democratic Party too but ultimately could not stomach their socialist economic policies and their love for unions. I also found the Democrats to be hypocrites on immigration. President Barack Obama held both Houses of Congress when he first took office. He did not lift a finger to reform immigration. In fact he went on to deport more people than any previous President! The Republicans can at least take credit for the Amnesty for immigrants that was signed by President Ronald Reagan. 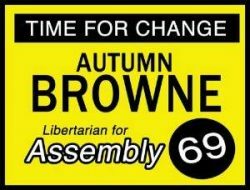 I hope Onofre will consider joining me in the Libertarian Party in the future but for now she is a Democratic candidate for the 74th Assembly District. Other candidates for the 74th Assembly District include Newport Beach Councilman Keith Curry – the guy who tried to get rid of the beach bonfire pits; Emanuel Patrascu, an aide to my favorite Assemblyman, Travis Allen; Huntington Beach Mayor Matt Harper, who used to work for OC Supervisor Janet Nguyen until she got him a six figure job at the OC Waste Management Agency; and Anila Ali, a middle school teacher. « Norby says his wife is bipolar but are the Fullerton cops out to get him? hmmm…. wonder if she’s just trying to bleed votes away from the real Democrat in the race. Or even if she’s being used that way without knowing it. I think that Karina is real. I mean, besides her being a Latina and supporting immigration reform and drivers’ licenses, I would have quit the party immediately after being disrespected! I mean, look at the lack of tact and respect the Tea Party of Costa Mesa bestowed on her in that youtube video. They are racists rednecks, plain and simple. You go sistah! And as a Democrat, I tell you, welcome back, you will win it! I am glad she stood up for herself! And if she doesn’t win I hope she comes back to Santa Ana ti run again for the City Council.